No doubt, Wikipedia is an ultimate free content internet encyclopedia, which educates you about anything and everything under the sun. Perhaps you may not find enough on 2×1 magnets because people aren’t searching for them. This is why this blog is titled 5 interesting 2×1 magnets facts that Wikipedia may never tell you. Who said impressions are the sole authority of large magnets. Who said a small item cannot make an impression. Who said “mini magnets are impression- less and expressionless”. Perhaps they should rethink about their statements because small magnets are extremely impressive. Have you ever pondered why the smallest and the biggest always capture attention? Why medium sized or middle never make it to the Guinness Book of Records? Because no one notices them. Similarly, if you believed that people would not take you seriously over 1×2 magnets then you’re wrong. Today, in this fast moving world, people don’t have time to read a flyer or brochure handed to them during the last tradeshow or promotional event. With their regimented work schedules, people cannot afford the luxury of sitting and reading the flyer or brochure over a cup of tea. They would appreciate anything, which is short, sweet, and adorable. You can easily do it by positioning your business logo large and bold over small promotional magnets. They may seem like a dot in the ocean of the large size promotional magnets, which you are habitual of seeing. This limitation of size works in favor of 2×1 magnets, which marketers can easily carry to tradeshows, corporate events or other mass venues. Available in various stock sizes such as 20 MIL, 25 MIL and 30 MIL, you can easily find the according to the requirement. Whatever be the stock size, they are weightless and easily manageable. This means you don’t have to spend on transportation rather you can manage them within backpacks. Who said small budget promotions are only for small brands? 1 x2 magnets are perfect for marketers of all budget sizes. All can creatively indulge such small magnets for awareness building or creating buzz about their brand. People would easily take note of small items than larger ones because they easily play before their eyes. Perhaps you might have heard this term several times before without knowing what does it mean and how does it relate to the particular situation. When it comes to these small magnets, it relates in the manner of its long shelf life and savings that you can avail on them. Many eCommerce stores stocking custom magnets offer savings in the form of free online design proof, free art setup, and free shipping.Additionally, you can save on full color printing, too. 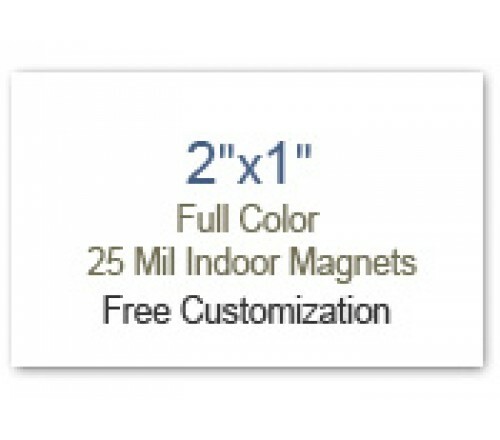 These stores allow you to further the savings by bulk ordering promotional magnets. As suggested before, you are also going to save on transportation and efforts by carrying these advertising magnets. What is the most challenging thing for an artist – painting over an extremely big canvas or negligibly small canvas? If you ever thought the latter one is extremely impossible, then wait a minute because it is quite possible only if you are ready to tax your brain. You have to find ways to present your information in a short, yet powerful way. And small magnets exactly help you to do that. They help to bring out your hidden creative talents and make a good marketer out of you. After reading these points, do you think a Wikipedia would have told you so much about 1×2 magnets? Perhaps no and never!